The Chinese Straddle Bus Exists! What Now? 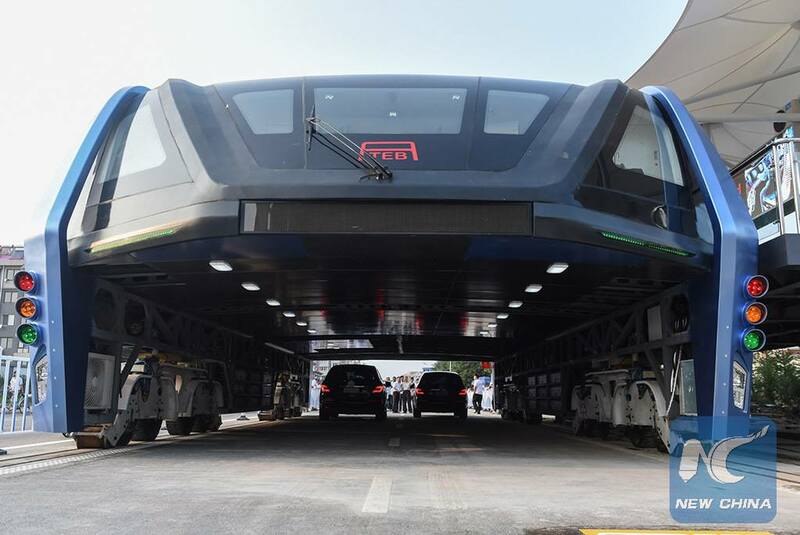 The Chinese straddle bus has now been built, and run on a test track! Whee! Here’s the gee-whiz video. As I said before, I think that especially in wealthy countries, this thing is mostly useful as a parable, whose message is: Look how much money people will spend on infrastructure whose sole purpose is to avoid taking any space from motorists. It’s massively capital intensive. The little rail-like running-ways in the street are the least of it, and the fleet is the second-least. 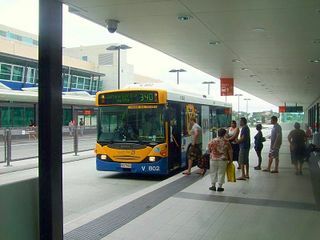 The stations must be massive elevated structures, with a mezzanine above the top of the bus. Existing bridges would almost all need to be raised. Countries with high construction costs will find this a barrier. It will serve stations located on expressways, which tend to be bad places for the pedestrians that the bus will attract and disgorge. 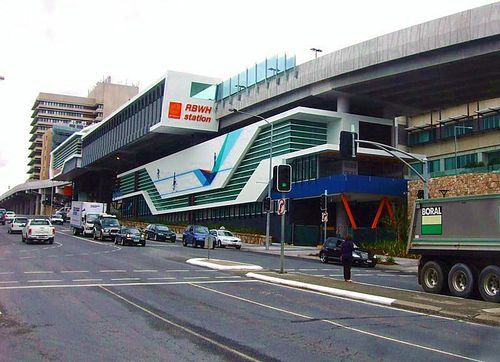 The only solution to this is massive grade separation, leading to a continuous pedestrian plane at the station level, well above the street. This leads to urban design that essentially abandons the ground plane to cars and rebuilds an entire pedestrian city above it. The vast raised pedestrian plane was a hot idea for about 15 minutes in the 1970s, giving us London’s Barbican, Paris’s La Défense, Los Angeles’s Bunker Hill, etc etc. Today, most European and North American urbanists hate these places and insist on solving problems on the ground plane, though of course the pendulum could swing again. But it’s much more common and accepted in East Asia, and to some extent in former Soviet countries. There’s also the problem that if you build this thing in an existing dense city, you are building it right outside of someone’s window. So you probably need a political structure that can make and enforce highly controversial decisions, as opposed to the kind of deference to public protest that prevails in most Western democracies. You really have to redesign big districts around this thing, which is another big barrier unless we are talking about entirely new areas. A high pedestrian plane only works if the idea is shared by many surrounding buildings. Where this thing connects with underground subway lines, your mezzanine for this elevated thing is at least four stories away from the subway’s mezzanine. This requires high-volume vertical circulation, which no inventor has ever really cracked. Elevators are really inefficient at high volume, and escalators are really slow at it. Having said that, if anyone can pull this off at scale, it’s probably China, which seems to tick all the boxes I’ve identified. They have the sufficiently centralized decision making, low enough construction costs, ability to do things at scale, and relative indifference to Western aesthetics that this thing requires. They are also building entirely new districts, which offer the best possibility for actually organizing a place around the correct elevated ground plane. So yes, it may happen, and it may do some good. Which doesn’t mean it’s not, deep down, ridiculous. Does the History of a Technology Matter? Ben Ross has a nice long read in Dissent about the history of Bus Rapid Transit, noting all the ways it’s succeeded, failed, and been co-opted by various non-transit agendas. He’s especially interested in the way various petroleum-and-asphalt interest groups have supported BRT as an alternative to rail for reasons that probably don’t have much to do with their love of great public transit. All this is worth reading and knowing about. Galileo paid the bills, in part, by helping the military aim cannonballs correctly. Does that mean pacifists should resist his insight that Jupiter has moons? The term technocratic is really loaded here. Given the new “revolt against experts” trend in our politics, we urgently need to recognize hard-earned expertise and to distinguish it from elite selfishness, but technocrat is a slur designed to confuse the two. There are some great bus rapid transit systems out there, and not just in the developing world. The mixed motives that underlie BRT advocacy don’t tell us anything about where BRT makes sense, any more than the mixed motives behind rail advocacy do. A light reading of history can help you recognize the prejudices that may lay behind advocacy on all sides. But then you have to set that aside, and think for yourself. I talk a lot about altitude in planning and network design. But sometimes my airplane metaphor gets mangled a bit in translation, as in this otherwise fine article about our work in the Raleigh, NC area. Last summer, we tested driverless minibuses along a route of 1.3 km on a pedestrianized boulevard in Oristano, a small town in Italy. The idea was to test driverless vehicles mixed with traffic. Why minibuses and not taxis? Firstly, because it is much simpler to teach a robot to follow a fixed route, rather than teach it to go anywhere the passengers want to go. Such a system is already operational in Rotterdam (2getthere.eu/projects/rivium/) and it works well, but it has one drawback: the tracks are segregated and they represent an ugly severance in the urban tissue. But if the vehicles are allowed to run with cars cyclists and pedestrians, a public transport route can be “adapted” with unobtrusive measures to accept driverless vehicles, and the people sharing the road will quickly learn to live with them. The main problem here was not technical, as legal. Hence the idea of testing similar vehicles in an open field mixed with pedestrians. The first test we did had mixed results, the second test that will be done in La Rochelle, France this winter will take advantage of all that we learned in Oristano. So what did I learn from all of this? That driverless cars very likely have a bright future, but cars they will always be. They may be able to go and park themselves out of harm’s way, they may be able to do more trips per day, but they will still need a 10 ft wide lane to move a flow of 3600 persons per hour. In fact, the advantage of robotic drivers in an extra-urban setting may be very interesting, but their advantages completely fade away in an urban street, where the frequent obstacles and interruptions will make robots provide a performance that will be equal, or worse than, that of a human driver, at least in terms of capacity and density. True, they will be safer (especially because the liability for accidents will be borne upon the builder) and a robotic traffic will be less prone to congestion (I envision robotic cars marching orderly like robots, packed at 1.5 second intervals, while their occupants fume wishing they could take the wheel perfectly aware, but not at all convinced that their robocars are more efficient drivers than they are – or worse, they DO take the wheel overriding the … robots! ), but I do not expect driverless cars to dramatically increase the capacity of a lane to transport persons. Driverless buses, on the other hand offer an interesting feature: the human driver is no longer needed, removing an important cost and several constraints. This allows them to serve efficiently and economically low-demand routes and time bands, while allowing [agencies] to concentrate the number of manned buses on high demand routes at little added cost. I take all this automation talk with a grain of salt still, as I don't think we've begun to explore the human response to it. But Luca is right about the key point: driverless buses are a much easier problem than driverless cars, and their space-efficiency will continue to be crucial in busy corridors where even driverless cars will add up to gridlock. Luca's last paragraph suggests that driverless buses will start with smaller vehicles in simpler situations, which is a possibility. But of course, once the concept is proven, the economics of driverlessness will create pressure to bring the technology to big buses. The same logic is also driving the movement to run fully-grade-separated without drivers, on the model of Vancouver, Dubai, and Paris. The logic of driverless trains is easy: with automated train controls systems there is really not much for a driver to do in non-emergency situations, and these cities have found that those tasks are easily automated. We are all used to small systems of this type, because we encounter them in large airports. The driverless bus in traffic is a harder problem, but we will have solved all of those problems if we ever develop driverless cars. In fact, the problem of the driverless bus, which never goes into alleys or minor streets, should be considerably easier, since navigation turns out to be one of the biggest challenges for the driverless car. Note also that the challenge of planning for driverless cars is not in envisioning a utopia where they have complete dominion over the street. The future must be evolved, which means that we must plan for the interim state in which some cares are driverless and most aren't. That is a situation where driverless buses could thrive, because they will be competing with something that — in terms of poor capacity utilization — resembles today's traffic on major streets, not a world optimized for the driverless car. As Luca indicates, we know what the problem with driverless transit will be: long fights with labor unions who feel entitled to cradle-to-grave security in a single job. It will be one more kind of automation that requires people to retrain and to participate in a more complex and competitive economy. In an ideal system, many drivers would be replaced by support jobs such as fare inspectors and roving problem-solvers; as on Vancouver's SkyTrain. This seems to be what Luca is envisioning when he speaks of the continued need for "manned" services. But the real result of massively abundant transit — which is the real point of the large driverless bus – will be massively more opportunity for all kinds of innovation and commerce to happen in a city, unconstrained by the limits of car-based congestion. That's a wrenching change, and I am as adamant as anyone about the need to protect workers from exploitation. But in the long run, over a generation or two, the outcome will more interesting jobs for everyone. Bus drivers shouldn't encourage their children to go into the same profession with the same expectations, but that's true of many jobs — perhaps even most jobs — in this rapidly changing world. Is transit headed for a collision with self-driving cars? David Z. Morris in Fortune writes about how anti-transit Republicans are using the prospect of self-driving cars to argue against transit investments. Alarmingly, he quotes nobody who can actually refute this argument, except in the fuzziest of terms. We are currently in that phase of any new techno-thrill where promoters make grandiose claims about the obsolescence of everything that preceded them. Remember how the internet was going to abolish the workplace? In any case, technology never changes facts of geometry. However successful driverless cars become, transit will remain crucial for dense cities because cities are defined by a shortage of space per person. Mass transit, where densities are high enough to support it, is an immensely efficient use of space. But all over the world, people are moving into dense cities, where even autonomous cars can’t replace a bus full of 60 people or a train full of hundreds. There simply isn’t enough space to put walls between every pair of travellers, as the car model of transportation requires. Nor will driverless taxis ever be there whenever you need them as great transit lines will. Like bikeshare systems, they will experience surges where many of the vehicles are in the wrong place. Again, technology never changes geometric facts. And the problem of cars in dense cities, and transit’s superiority there, is a geometric fact, a fact about space and its scarcity.